“Okay, I should be home in ten minutes,” I told my husband, Joe, last Wednesday evening. It was about 6:00, and I was leaving Barnes & Noble so we could all go out for dinner. But when I walked in the door ten minutes later, it was chaos. Charlie and Henry were crying on the couch and Henry was—inexplicably—holding a bag of chocolate chips to the back of his head. Jack sat at the counter, weeping and digging a stubby yellow pencil into a piece of paper. From what I could gather from the five voices talking together, Charlie had pushed Henry and Henry bumped his head and Jack didn’t want to finish his homework. And then—as we say in our house—Joe blew a gasket. He glared back at me while everyone started to talk at once again. And there we stood in the kitchen, the seven of us, screaming at each other. Avoiding each other, Joe and I shuffled them into boots and coats and hats, and ushered them out the door. Except Jack had one last thing to say. Standing in the mudroom, I watched sadness—defeat—replace the anger in Joe’s face. His shoulders sagged as he looked down at his second-born son. Hot tears pricked my eyes. Lately, Jack’s been doing this. If he’s mad or frustrated with someone in our family—Henry or Joe in particular—he demands we get rid of them, that he doesn’t want them anymore. Does he have an attachment disorder on top of all of his other problems? Does he really wish his father gone when he’s angry? Maybe it’s because his mind sees everything in black and white—his autism is perpetually stuck in Kansas before the tornado turned everything into rainbow hues. In this dual-tone world, his reactions are simple, straightforward; Dad makes me mad, if he weren’t here I would be happy. When he does this, I want to remind him of all the times his father rocked him as an infant into the wee hours of the morning, because the searing pain of ear infections prevented him from sleeping night after night. 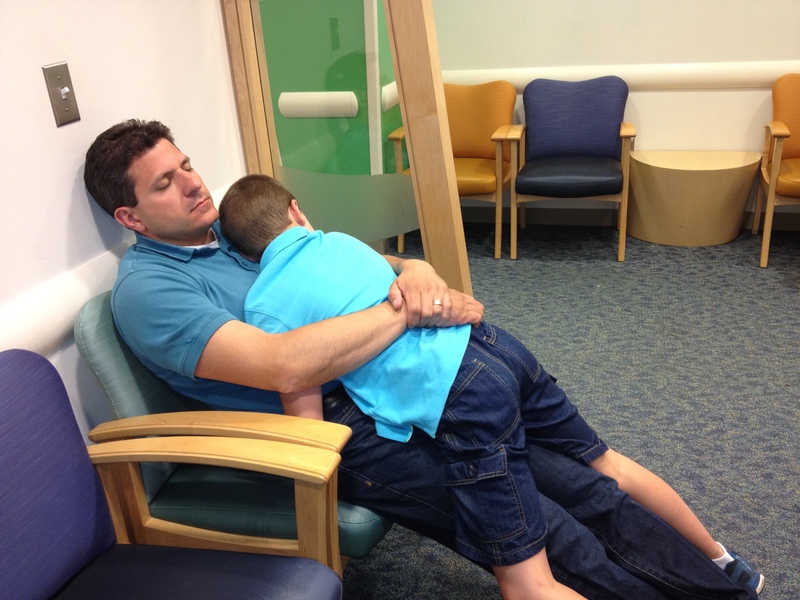 The way Joe cradled him in Children’s Hospital last spring while we waited for his eyes to dilate, how he tenderly lead him back to the exam room while Jack whimpered I can’t see Daddy I can’t see. The way they make pancakes every single Saturday morning, how together they mix the batter in a large glass bowl and pour funny shapes onto the griddle; hearts and spiders and a lopsided Idaho. Does this happen in your house? Are you one minute thinking, I think I’ll order the cheese enchiladas tonight, and the next minute trying to figure out how to patch your family back together again, to dry the tears and soothe the hurts and promise there will be no divorce? You know what? It doesn’t really matter, because this is how my family is. We are messy and loud and some of us are grumpy in the morning and a few of us always have stains on our shirts. We yell. We talk over each other and hug very hard and brag when we win at chess. In many ways, we resemble a sweater knitted by a child; lumpy, with loose threads and mismatched yarn, but full of love and warmth and hope. And yet, I believe we are ordinary. Even Wednesday night’s problems are mundane; I forgot to tell Joe that I said Jack could be done with his homework and Henry is the youngest so we sometimes take his side too much and it’s really, really hard to know the true story when everyone is talking at once. Basically your regular, run-of-the-mill breakdown in communication and issues with birth order and the chaos of five kids. It’s very possible we’ll never solve these things for good. Joe and I will always forget to tell each other stuff and Henry will forever be the baby. There will always be homework and for the foreseeable future, there will be autism. Maybe the measure is not how quietly we fight or loudly we shout or how well we solve long division, but how quickly we heal and recover once the storm passes. And so, on the twenty-minute drive to our favorite Mexican restaurant, we declared a do-over; our family’s familiar term for starting again. We gave each other the space to talk and air grievances, to explain and defend. We knitted ourselves back together with small jokes and quiet apologies. I can’t say we were completely back to normal by the time we pulled into the half-empty parking lot, but we were better. The tears had dried. We walked into the warmly lit restaurant and arranged ourselves at the long wooden table in the center of the room. Jack trailed in last, and the only seat left was next to Joe. My stomach tightened because I anticipated outrage, a scene, more of the divorce chant. But he dropped into the chair and shrugged his coat off. I waited—on purpose, I waited—until he was halfway through a basket of tortilla chips, and then I asked him if he was feeling any better. “We sure did,” Joe said, balancing a chip piled high with salsa and leaning into him just a little bit. Watching them chew, I felt love and warmth. And hope. 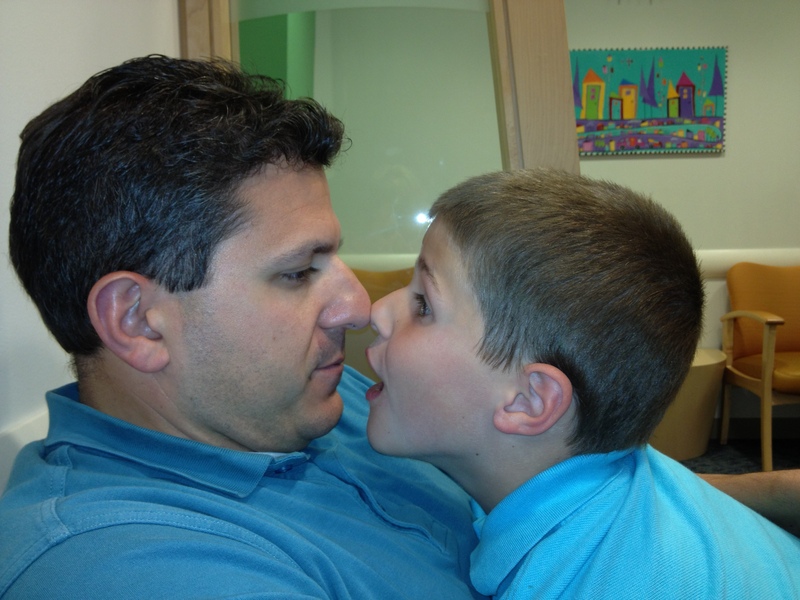 Want to learn more about the Cariello family, five kids, and autism? Be sure to check out Carrie’s book, What Color Is Monday? How Autism Changed One Family for the Better. Now available in paperback, Kindle, and Nook on Amazon.com, Barnes and Noble, and some local bookstores. Our family fights often seem to end with a big family pizza night. I love the cadence and rhythm you bring to family interactions. Each note so different. In answer to your possibly rhetorical question, yes, we have a child that does this too. Our youngest who thinks in black and white with rigid rules routinely decides he’ll “never love mommy again”, “never play with Daddy again”, “daddy’s no good, I only like mommy”, etc. Our daughter never does this stuff except for a short phase when she was 3, but our son always has an extreme reaction to perceived hurts and slights. He also ranks us by color and lately by number. I used to have to ask everyday what color I was on. He has no trouble telling Daddy that he’s been bumped to number 6 behind grandparents and his sister. He is forever telling us exactly what he thinks of people – loves one extended family member because she always sends him cookies, dislikes another because “he has a weird face” (his face is just a regular face btw), thinks another one has a “weird smell”. His opinions are strong, vocal and unalterable. Luckily, an hour later he often changes them of his own accord, so we’ve learned not to take the “I’ll never love you again,” and the “I wish you would die,” or “I wish I were dead,” not too personally because it seems to be his way of expressing strong emotions and he doesn’t have the social filter that would make you hold your thoughts inside until you calmed down a bit.